From 10 o’clock New Year’s Eve to 2 the next morning, Bartlesville’s Police Chief Tracy Roles made himself available for a special event. Chief Roles provided rides to anyone that may have enjoyed the New Year’s Eve festivities a little too much. Roles says the event provided great fellowship. That fellowship came with the people they took home who appreciated the service that they provided to the community. He also says the fellowship came with the group of officers gathered around waiting for calls to come in. That allowed for them to reflect on 2018. Roles says it also allowed them to focus on their direction in 2019. Only two calls came in last night. Chief Roles had some concern that people thought it may have been a trick to bring people to jail. He says that they had no intentions of tricking people. The more the Bartlesville Police Department does community functions like this, the more Roles hopes they will develop trust with the community. Roles says he wants to continually expand community involvement. 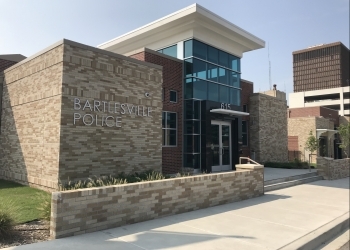 That to him will require seeking more ideas outside the box that the police department can do for Bartlesville's citizens. Chief Roles would go on to commend the Bartlesville community for their responsibility during the New Year’s Eve festivities. He says no DUI arrest were made when he was holding the special event last night until about 2:45 in the morning. Another success on the night includes the fact that no one vomited in Chief Roles' vehicle. The officers were concerned about that going into the night Monday.